Whether you eschew meat out of personal preference, for religious observance or because of health concerns, the Academy of Nutrition and Dietetics affirms that a vegetarian diet can be completely adequate for good nutrition. Because meat is an easy source of essential nutrients, including iron and protein, healthy vegetarianism takes careful planning. Adults need roughly 8 grams of protein per 20 pounds of body weight, according to the Institute of Medicine. Meat is a complete protein, meaning it delivers all the amino acids the body requires. A vegetarian must vary his diet to include seeds, nuts, fruits, vegetables, grains and, depending on the type of vegetarianism, possibly eggs and dairy to obtain a complete complement of amino acids. All types of vegetarians can partake of two sources of complete, plant-based protein: soy and quinoa. Your body absorbs heme iron, the type found in meat, better than nonheme iron, the type found in plants. Vegetarians should pair fortified cereals, dark leafy greens, molasses, dried fruit and other iron-rich foods with vitamin C-rich produce, such as oranges, to enhance absorption. 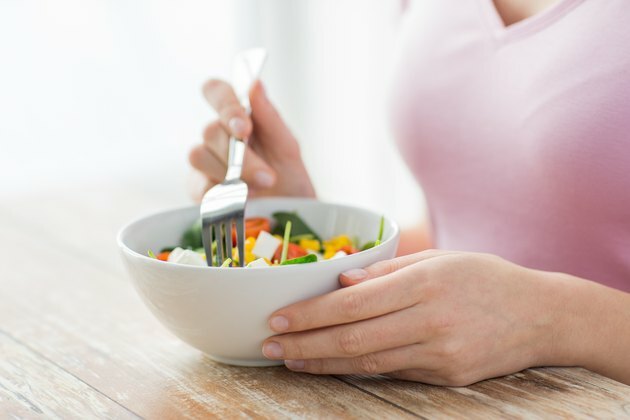 Additionally, vegetarians may be slightly more prone to calcium, zinc, vitamin B-12, vitamin D and omega-3 fatty acid deficiencies than meat eaters, but that can be rectified by eating a variety of foods, including those fortified with vitamin B-12, which is only found in animal products. What Supplements Are Best for a No Meat Diet?